The Wardle family lived at 27 Farnham Street, Quorn, from about 1919 to the 1940s. Farnham Street was renumbered around 1950, so today the house is number 31. Artefact 1318 on the museum website, features an article from the Loughborough Echo on 12th October 1945, and is a report of the funeral of Leicester born Herbert Sargeant Wardle, who was a signalman on the Great Central Railway/LNER. The first photograph below is the original from which the newspaper picture was taken. 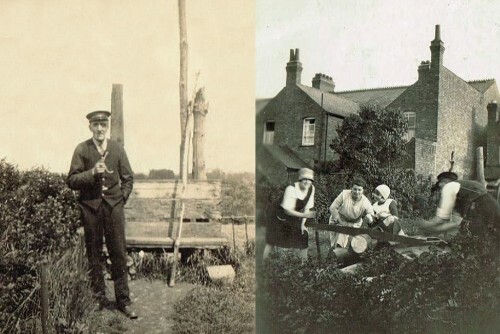 The second photograph shows Herbert with his family in the back garden of 27  Farnham Street. They are cutting wood and seem to be enjoying themselves! Note that Herbert is still wearing his uniform. Two of the women are almost certainly Herbert’s wife Frances, and their daughter, also called Frances. Thanks are due to Herbert Wardle’s great-grandson, who got in touch with the museum team and provided the photographs, after seeing the article in artefact 1318.